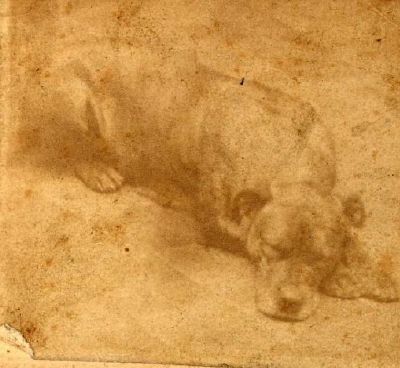 It was during the first month of training in 1861 for the new 11th PA Volunteer Infantry Regiment when a stranger from town brought to the captain a puppy, barely four to five weeks old, and presented it to the regiment. She was a pug-nosed brindle bull terrier that soon won the admiration of all the men in the unit. She was cute, and the men named her after one of the local beauties in West Chester, PA, the site of training. In the weeks and months that followed, Sallie could count on the hundreds of uniformed men to play with her, give her some petting, and scraps of food. Thus Sallie became the mascot of the 11th PA Volunteer Infantry Regiment. The little dog quickly developed a personality of her own. She was said to be even-tempered and very affectionate towards all the men of the regiment. It is said that there were only three things Sallie had a distaste for, Rebels, Democrats and women. Sallie got to know the drum roll for reveille and was always the first out of quarters to attend roll call. During drills, she would latch onto a particular soldier and prance alongside him during the exercises. At dress parade, she would station herself right alongside the regimental colors. Sallie would frequently sleep by the captain's tent after strolling through the camp on an inspection of her own. Sallie's first battle came at Cedar Mountain in 1862. She steadfastly remained with the colors throughout the entire engagement. She did the same at Antietam, Fredericksburg, and Chancellorsville. No one ever thought of sending Sallie to the rear in time of combat. She was the regiment's spirit and its inspiration. During all battles she would race around the front line and bark ferociously at the enemy. In a spring 1863 review of the Union army, Sallie marched alongside the 11th Pennsylvania. A tall man in the center of the reviewing stand saw the dog. With a twinkle in his eye, he raised his stovepipe hat in salute. Thus did Abraham Lincoln give a special acknowledgment to the mascot. On the first day's fighting at Gettysburg, the 11th Pennsylvania was driven back from Oak Ridge and into town. During the chaos, Sallie became lost and three days later was found by a member of the 12th Mass. at the original position of her regiment when fighting broke out. Sallie had found her way back and was standing guard over the bodies of her dead compatriots. Neither hunger nor thirst swayed Sallie from her duty. That following May at Spotsylvania, Sallie received a neck wound during the battle and proudly bore a "red badge of courage". On February 6, 1865, the 11th Pennsylvania made a concerted attack upon the rebel lines at Hatcher's Run. As always, Sallie was right at the end of the first line of attack. Men in the second wave were advancing under heavy fire and came upon the body of Sallie. She had been shot through the head and killed instantly. Under horrendous fire, the weeping men of the 11th Pennsylvania buried the little dog where she lay on the battlefield. 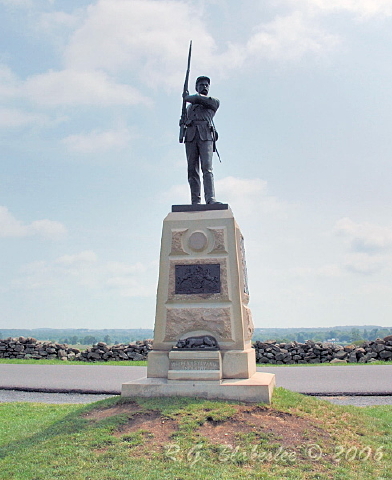 In 1890, the surviving members of the 11th Pennsylvania Volunteer Infantry dedicated a monument on Oak Ridge of the Gettysburg Battlefield. There, looking out over the fields in the direction from which the rebels came, stands a vigilant bronze soldier, high atop a marble pedestal. The monument is dedicated to all those of the 11th Pennsylvania Infantry who fought and died at that great battle. But, there is something else on that monument that many do not see unless they get out of their car and walk around to the front. At the base of the statue is a bronze likeness of a little dog. It is Sallie ... keeping watch through eternity over the spirits of her boys, just as she did so many years ago during all of the battles they shared. A dog so loyal and full of love for her men that they insisted she be remembered on 'their' monument, for all time. Loyalty, among both Union and Confederate soldiers, was a driving force through four bloody years of war. And it was not just confined to humans. Shown to the left in this faded carte-de-visite is Sallie, the mascot of the 11th Pennsylvania Volunteer Infantry. Present at Gettysburg, “Sal” stayed loyal to the regiment through every battle and skirmish until she was killed at the Battle of Hatcher’s Run, Virginia, in February of 1865. 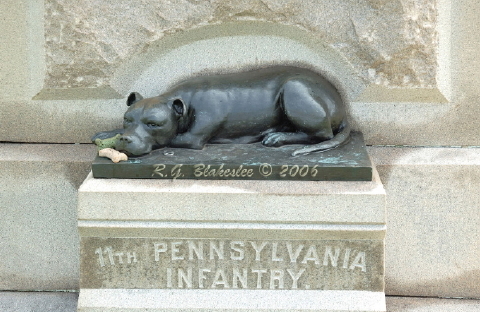 The 11th's monument at Gettysburg features a bronze likeness of their beloved and ever-loyal companion.